It’s been over six years since California voters approved a bond measure to fund a two-hour-and-forty-minute Los Angeles to San Francisco high speed rail system. Today groundbreaking finally takes place in Fresno. In the intervening six years, lawsuits and political compromises have delayed the system and likely made the timetables promised to voters impossible to achieve. And even if all goes well, the system won’t fully connect Los Angeles to San Francisco until 2028, and that estimate seems wildly optimistic. Yet today’s ceremony is still cause for celebration. Building a massive infrastructure project like this one across the state and its multiple political jurisdictions and interest groups is an almost impossible task. High speed rail, even if it’s less than perfect, will be an important contribution to the environmental and economic future of the state. With a growing population, California can only hope to move its residents efficiently via expanded rail, given the practical and economic limits on expanding our highways and airports. 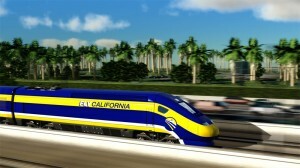 High speed rail also holds the promise of better integrating our existing transit systems and encouraging new ones, particularly in the Central Valley — a region that has missed out on the economic boom on the coast, in part due to its relative isolation from these economic centers (the UCLA/UC Berkeley Law report from 2013, A High Speed Foundation, details the potential benefits for the Valley from high speed rail, while UC Davis law professor and Legal Planet co-blogger Rick Frank sits on the board of the High Speed Rail Authority). But continued legal uncertainty will plague the project in the coming years. First, CEQA petitioners may appeal the STB decision to federal court. Second, the California Supreme Court will look at the issue of preemption raised by two conflicting appellate decisions (Friends of the Eel River and Town of Atherton). Finally, the courts will scrutinize the Authority’s final funding plan to ensure it complies with the strict terms of the 2008 ballot measure, such as the two-hour-and-forty-minute time requirement for the Los Angeles to San Francisco segment. Given that political compromises have greatly slowed the system’s cross-state travel, such as by diverting the Southern California route to Palmdale, serving hostile Central Valley cities in the eastern San Joaquin Valley directly rather than with spur lines, and using slower Caltrain tracks on the San Francisco Peninsula, meeting these timetables may very well be impossible. All aboard for another taxpayer ride to benefit the politically well-connected. All will pay so that some can profit. A massively inefficient and unfair idea that only a politician could love. The digital marketplace is demonstrating that human ingenuity is a far superior resource to solve any economic issue, than is the tried and failed tax and regulate mentality of the past century. There is simply no reason to make transportation of people a government project. Unless, of course, you enjoy imposing centrally planned projects on an unenlightened public. Texas continues to boom while California continues to sink. Smart folks keep coming here to escape the confiscation and pathology that flows from ignorance. High speed rail, cap’n trade are corrupt worthless graft foisted on willing fools. Don’t try this in Texas. Low price fossil fuels creates more demand which releases more carbon dioxide emissions which massively exceed and overwhelm all of California’s paltry carbon mitigation schemes combined. Hurrah for environmental enlightenment !!! Let that be a lesson for those of you who are capable of understanding. California will never ever succeed in exporting its collective ignorance to Texas. Rest in pain you silly people (get smart and move to Texas). Our conventional notion of passenger trains comes from a day when freight and pax were in the same train, ran on the same rails and so on. This has ultimately resulted in a very high ratio of vehicle weight to cargo weight for passenger cars, which are pretty much air occupied by a small amount of meat, because another car in the same system was carrying iron ore. It would be a lot easier to carry passengers in a system designed from the rails up (or down) to carry a very lightweight cargo, and we can imagine a lot of lower cost, innovative technologies to do this without even getting very technological – for example, hanging the cars from a single overhead rail, with the cars made more like airplanes or even cars than barges. This would also mean that we could use existing freeway right of way by running the pylons in the median and the rails raised. If we are running dedicated pax only right of way, we should think about whether or not we should be continuing design paradigms which originated with the Roman empire (standard rail gage is based on Roman chariots).